Feel devalued is common as we age in this modern age, especially as technology changes everything so quickly. We can quickly start to feel left behind, especially after we’ve left the workforce. We can feel like we aren’t contributing meaningfully to society any more, or that we are no longer “useful.” Many other factors can also have an effect and create negative stigma: some components of our aging bodies begin failing, so we are not as physically strong as we once were. One of these components that often fails is our hearing. 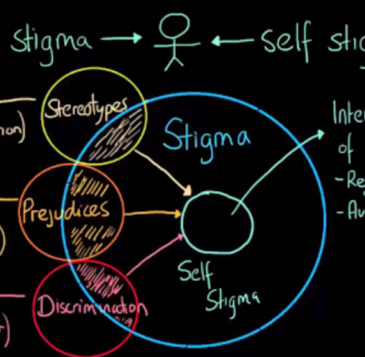 More difficulty communicating with the people around us can create a stigma that may in turn cause to deny any problem exists at all. When we are in denial we do not seek treatment. Out-of-pocket cost for hearing devices is a major deterrent to obtaining them. Even more of a deterrent, however, is the negative stigma towards the need for them. Admitting that I have a need for hearing aids is admitting that I am getting older and that my body is breaking down. Many people are not willing to make that concession. Family and friends who don’t understand the challenges of hearing loss create further stigma. Even the advertising for new hearing aids being “invisible” can create stigma—a feeling that having hearing aids is something to be ashamed of. Since we know that the overall stigma against hearing loss and hearing aids is there, and also that this stigma can lead to a postponement in dealing with the issue, we should be able to figure out what we can do about it, right? As with most issues, we can begin with education: both for the public and for those who sufferer from hearing loss. If you are struggling to hear and communicate effectively on a regular basis, the choice seems clear: use hearing devices! Since the technology is available, we should definitely use it, instead of suffering in silence. Modern hearing aids allow you to effortlessly and inconspicuously hear everything in your environment. You don’t have to be embarrassed by miscommunication any longer! The easiest and most effective way to halt the progression of hearing loss is regular hearing screenings. Hearing screenings can ensure any hearing loss is detected and treat hearing difficulty early on, preventing further deterioration. Hearing screenings can detect hearing loss much earlier than you will notice it on your own, so it is crucial to begin regular audiologist appointments before you think there is a problem.